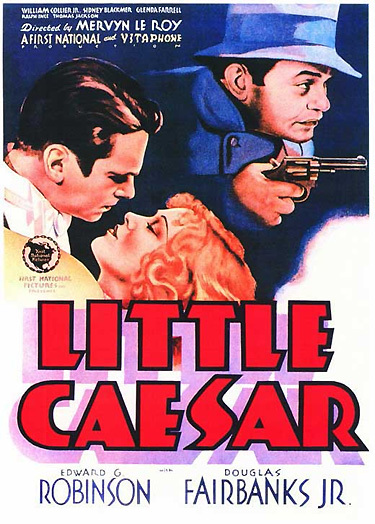 One of the most well-known and best of the early classical gangster films is Warner Bros.' and director Mervyn LeRoy's Little Caesar (1930). It is often called the grandfather of the modern crime film, with its quintessential portrayal of an underworld character that rebelliously challenged traditional values. Although it was not the first gangster film of the talkies era (that honor went to Lights of New York (1928)), it is generally considered the prototype of future gangster films. It is a taut, fast-moving (at a brisk 80 minutes) and vivid film that set the genre's standards and launched the entire popular film type. This early, seminal gangster film, that opened in New York near the end of 1930, arrived around the same time as a few other prison-crime films, such as MGM's quintessential The Big House (1930) with Wallace Beery, LeRoy's own Numbered Men (1930) and I Am a Fugitive From a Chain Gang (1932), Howard Hawks' The Criminal Code (1931), and The Last Mile (1932). Little Caesar reflects the technically primitive nature of early film-making, with a straight-forward, blunt narrative (composed of a series of tableaux), yet its hard-hitting gritty realism gripped audiences. Unlike many other gangster films, the film did not feature graphic bloodshed, depict violence on-screen, or sensationalize street language, but its tone was somber and tough. Its low-budget sets and cheap, sleazy atmosphere added to the film's impact. The film's rich black-and-white cinematography was provided by Tony Gaudio. W. R. Burnett, the author of the novel on which the film's screenplay (by Francis Faragoh and Robert N. Lee) was based, was also co-scriptwriter of Scarface: The Shame of the Nation (1932). And the gangster genre made indelible stars of "tough guys" Edward G. Robinson, James Cagney, and Humphrey Bogart. The movie also made stars of Darryl F. Zanuck, the production head, Hal Wallis, the producer, and Mervyn LeRoy, the director. However, after 1934, the hard-hitting, violence-prone gangster genre was virtually curtailed by the restrictive Hays Production Code, and as a result, Little Caesar and The Public Enemy were withdrawn and not allowed to be re-released until 1953. The Power-Mad Monarch of the Murder Mobs! Before this film, Robinson had already starred in The Widow From Chicago (1930) as a vice-lord racketeer. Here, wide-mouthed, squat and pug-faced Little Caesar (or Rico Bandello) is a tragic hero: overly-ambitious in his goal of becoming a crime lord, and although he achieves his goal in his rapid rise to power, he is machine-gunned down in the final scene during an equally-rapid fall. For his eighth sound film, Edward G. Robinson should have received an Academy Award nomination for his role as gangster Caesar Enrico Bandello, but the film had only one Academy Award nomination: Best Writing Adaptation (by Francis Faragoh and Robert N. Lee) that went unrewarded. Now typecast, Robinson would reprise his star-making, tough-gangster role in a variety of gangster-crime films, such as William Wellman's The Hatchet Man (1933), John Ford's The Whole Town's Talking (1935), The Last Gangster (1937), A Slight Case of Murder (1938), Brother Orchid (1940), Key Largo (1948), and Hell on Frisco Bay (1955). In the short opening scene of the film seen in long-shot, a car drives into a gas station. The passenger gets out and holds up the attendant, backing him up into the station with his hands held high in the air. The lights go out and three gunshots are heard during the cold-blooded murder. The thief/killer gets back in the car and the getaway car wheels off into the night. Joe asks: "What's that got to do with the price of eggs?" The small-time punk admires the adulation the mobster receives without having to go beneath his dignity: "Plenty. Diamond Pete Montana. He doesn't have to waste his time on cheap gas stations. He's somebody. He's in the big town, doing things in a big way. And look at us, just a couple of nobodies, nothin'." Rico, or Caesar Enrico Bandello, according to Joe, wishes to be "honored by his friends," and to have the notoriety of big-time gangsters. I could do all the things that fella does, and more, only I never got my chance. Why, what's there to be afraid of? And when I get in a tight spot, I shoot my way out of it. Why sure. Shoot first and argue afterwards. You know, this game ain't for guys that's soft! Joe admits that there's money and women, "good times," and "excitin' things" in the big town for them, where their fame and fortune lie. But Joe reveals different goals and an alternate path from Rico: "And then I'd quit Rico. I'd go back to dancin' like I used to before I met ya. I don't know. I ain't made for this sort of thing." Rico is incredulous that his pal would want to forsake everything for his previous career as a dancer: "I don't want no dancin'. I'm figurin' on makin' other people dance!" Rico: Yeah, money's all right, but it ain't everything. Yeah, I'll be somebody. Look hard at a bunch of guys and know that they'll do anything you tell 'em. Have your own way or nothin'. Be somebody. Joe: You'll get there, Rico, you'll show 'em. Rico: Joe? This was our last stand in this burg. We're pullin' out. Joe: Where are we goin'? Rico: East! (He gestures toward the newspaper story) Where things break big! They arrive in the big city - never identified (probably either Chicago or New York). Rico goes to Club Palermo, where he speaks to gangster chief Sam Vettori (Stanley Fields) who is playing solitaire. Rico talks his way into becoming a member of the gang: "You won't be sorry for lettin' me in, Mr. Vettori. I'll shoot square with ya. I'll do anything you say. I ain't afraid of nothin'...There's nothin' soft about me. Nothin' yella. I don't quit." Rico is hired for his quick ability with his "rod," but reminded by the kingpin that it isn't the "sticks": "All right, you stick around, but remember, I'm the boss and I give all the orders. And when we split, we split my way, and no squawks, you get me?" In another memorable scene when Rico is introduced to the gang, the camera subjectively pans over close-ups of the mean-looking faces of the members of Vettori's gang ("the boys"), approximating Rico's point-of-view: Tony Passa ("can drive a car better than any mug in the town") (William Collier, Jr.), Otero ("he's little, but he's the goods all right") (George E. Stone), Killer Peppi (Noel Madison), Kid Bean (Ben Hendricks, Jr.) and others. Vettori tells them about newly-hired Caesar Enrico Bandello: "I want you to meet a new guy what's gonna be with us." Vettori bestows the name "Little Caesar" upon Rico. Joe: Once in the gang, you know the rest. Olga: I don't want to know. Only maybe, maybe it could be different this time, if we try. Joe: I've never seen a guy that could get away with it yet. Now the 'Big Boy' wants me to tell you guys to put the chains on your gorillas for the next few months, because if any of them go too far, it will be just too bad...Nobody's squarin' nothin' with McClure, not even the 'Big Boy'. Montana singles out Vettori's trigger-happy Rico for a warning: "It's guys like this torpedo of yours that cause all the trouble." In the hallway as Vettori leaves, he approaches Rico and advises: "You take it easy with that cannon of yours."